PHYTO SOLAIRE-THALASSO: la risposta alla Voglia di Sole e Mare, 365 giorni all'anno. IL FORMATO: flaconi 150ml DOPO SOLE - SENZA CONSERVANTI Trattamento Dopo-Sole per viso e corpo. Anti-età, lenitivo, disarrossante, idratante e nutriente. Ideale anche per pelli già disidratate, mature e per i bambini. Proprieta' benefiche: > A base di Burro di Karite', derivati del Frumento, Chitina, Lisina, Aloe e Calendula, per idratare intensamente e contrastare lÃ¢Â€Â™invecchiamento precoce. > Lenisce rossori e irritazioni. > Attenua le reazioni di sensibilità causate da fattori ambientali. > Fissa lÃ¢Â€Â™abbronzatura, rendendola più luminosa e duratura. > Rinfresca e ammorbidisce la pelle. > Perfetto anche per i Centri di Abbronzatura. > Sali del Mar Morto che assicurano unÃ¢Â€Â™immediata azione rimineralizzante ed idratante dellÃ¢Â€Â™epidermide. MODO D'USO: Applicare su viso e corpo dopo ogni esposizione al sole o a lampade UV. PHYTO SOLAIRE-THALASSO: the best anwer to the Wish of Sun and Sea, 365 days a year. BOTTLES 5 FL.OZ. AFTER SUN - With NO PRESERVATIVES AFTER SUN TREATMENT with hydrating, anti-aging, soothing and nourishing properties for face and body. Recommended in case of dehydrated and aging skin, and especially on children's skin. Including: > Shea Butter, Wheat Extracts, Chitin, Lysine, Aloe and Calendula, to deeply hydrate the skin and treat the aging signs. > Against reddening and irritation. > Softening the sensibility reactions cause by environment factors. > Fix the suntan with shining and lasting effects. > Calm and refresh the skin. > Excellent for the Tanning Centers. > Dead Sea Salts developing a powerful mineralizing and hydrating action on skine. 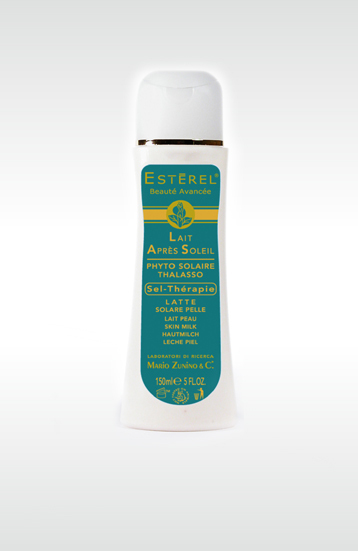 USE INSTRUCTIONS: Apply on face and body after every sun or UV lamp exposure.